I am designing simple security system to protect 20-30 windows (total length about 50m) with vibration sensors (based on SW-420 modules). Window are on the roof and due to environment i use optocouplers for controller isolation. I want all of that sensors to be connected to one wire, something like Logic OR. When sensors has LOW on OUT pin, optocoupler cathode has ground pulled via R21 resistor - controler pin has LOW. When sensor is active, transistor Q sends 5v to optocoupler cathode, and IO pin getting HIGH via Pullup resistor R20. Note: I places pulldown resistor at the end of line. So if signal or ground wire is terminated (cutted, disconnected), alarm will be activated. I tested this circuit with only two sensors (don't have any more). Look's like working well. But i am worrying about stability and safeness when there will be 20-30 sensors on single line 50m long. Also i were trying to replace sensors with HC-SR501 PIR Motion. Unfortunately this circuit not working. Looks like 3.3v with 0.6v drop cannot drive 2N2222. May be other transistor will work? 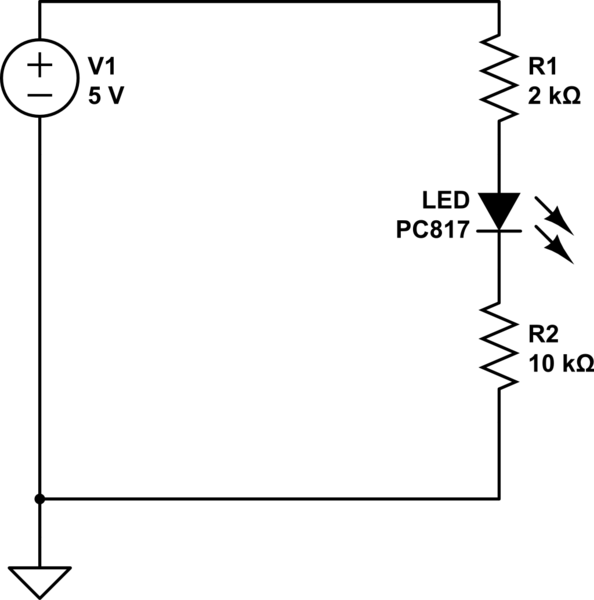 So, will this circuit works stable and safely when scaled up? (may be some capacitors). Also is R23/R24 resistor is necessary (i tried without them, and placed in schematic just in case). 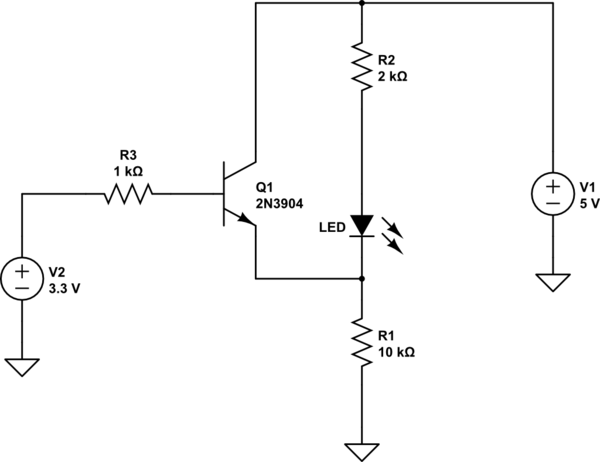 Is 2n2222 is right choice for this circuit? Is 2kOhm for mosfet gate pullup is enough/to much? 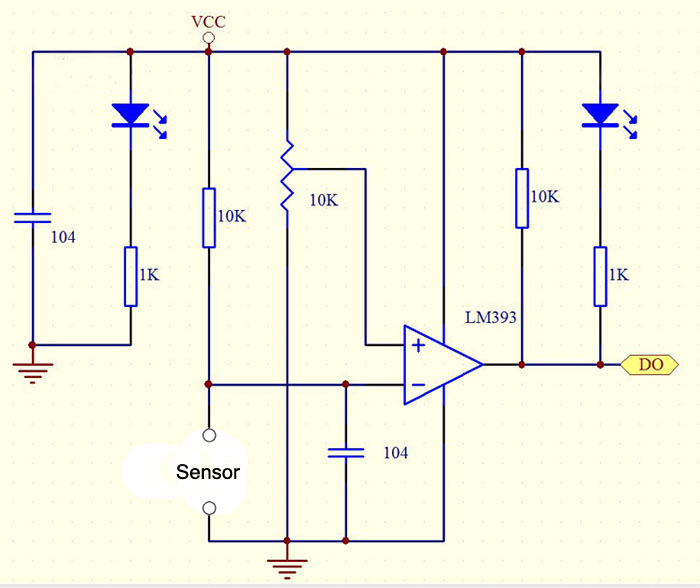 Will mosfet close when transistor closes? Unfortunately this circuit not working. Please make up your mind. My vote is that it's not working, and it never will. Let's look at a single unit. Let's assume the input is at zero volts. Then, for a Vf of 1.2 volts (which will not be quite right, since that's the nominal value at 20 mA), the total current will be 0.31 mA, and the voltage at the transistor emitter will be 3.1 volts. If the input voltage goes to 3.3 volts, this only produces (at most) 0.2 volts across the base-emitter junction, and the transistor does not turn on. Even if it does turn on, it cannot lift the LED anode to more than 3.3 volts, and this will not turn off the LED. Replace the 10k resistor with a 200 to 500 ohm resistor. This will produce a much lower voltage across R1, and will allow the transistor to operate. 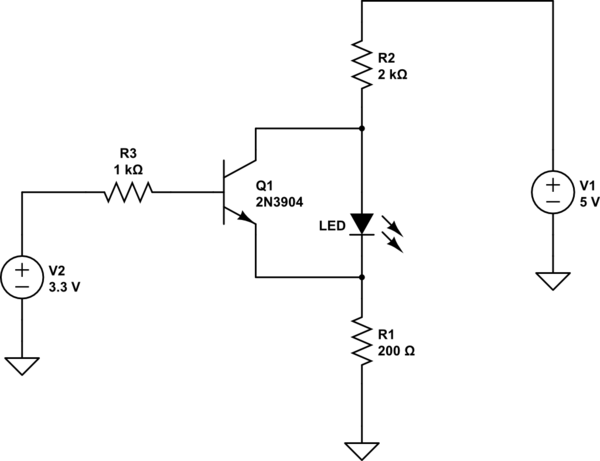 With 2k on R2, the LED current will only be about 2 mA or a bit less, so the transistor should have no difficulty, and the transistor will act to directly bypass current from the LED. I want all of the sensors to be connected to one wire, something like Logic OR. As pointed out by @Marcus, the current in the PC817 input diode is chronically low, and unlikely to produce a signal for your MCU. The 1k Ohm resistor will (depending on the SW420 variant you have) result in signal indicator failing to turn off. Your logic is incorrect since the output of the SW420 is normally high, and goes low on breaking the sensor. There are two major circuit configurations for the SW420. Read the setup and operation here. Here the current in the PC817 is set to about 5mA and if ANY (OR logic) of the sensors trigger low on the out pin the current is applied to the PC817. Update: Since the modules you have appear to be logically reversed (perhaps they have reversed the input pins on the comparator) you can still use FET OR'ing, but would need to change the circuit to suit. You would have to take care and check that when buying modules they produce all produce the same logical output. So, that's 12 kΩ in series with the LED. Hence, the current through the LED is If=(5 V - Vf)/12 kΩ . Since the datasheet suggest the thing won't turn on below a forward voltage of 1 V, If_max = 4V/12kΩ = 0.33 mA. 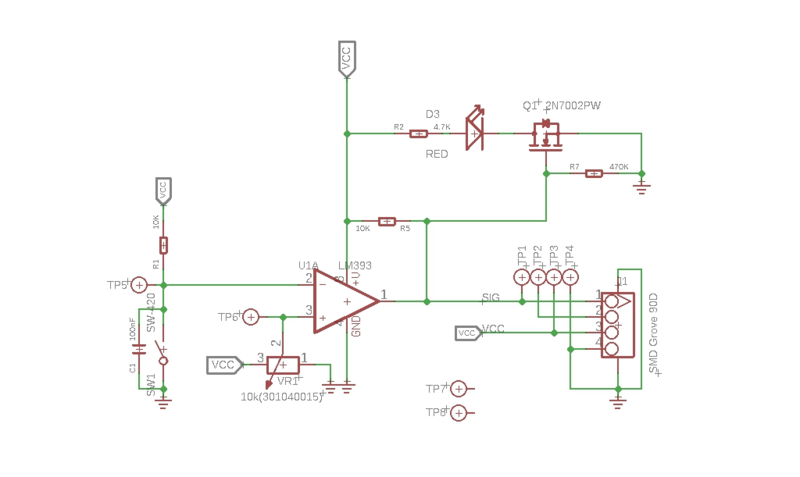 That LED has full brightness at 20 mA; at 1/60 of that, the Optocoupler won't work reliable. The solution would be very easy: just tie all your OUTs together (if necessary for protection, with a diode each, and use that either directly as high side of your LED, if current sourcing of the SW420 allows, or connected to the base of one of your low-side NPN switch transistors. Not the answer you're looking for? Browse other questions tagged arduino transistors sensor or ask your own question. Why is the relay switched by a NPN transistor still on while the Arduino out is off (low)?